We don’t just speak computer jargon and program electronics, we also know a thing or two about how restaurants work. We craft successful POS systems because we have been in and around the industry. Our team comes from a restaurant background which helps us deliver higher quality solutions than our competitors. We know you are passionate about your restaurant and your POS company should do the same. 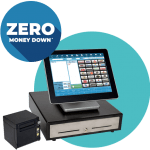 Our goal is to offer you the most powerful, robust point of sale solution available, with the features and customization options that make your establishment more efficient, profitable and cutting-edge, all for a reasonable price. Our competitors charge much more for less. Our pricing options can get you into top notch POS software & hardware at a fraction of the traditional cost. Our software supplies you with many of the tools you need, right out of the gate, fully customized for your specific business. Take your restaurant one step further by integrating one or all of our customized POS Services. Great features are, literally, at your fingertips. Our tailor-made menu layouts, buttons, and graphics are all designed around your business and set up with the specific user in mind, whether it’s management, service staff, or your customer. Handheld devices provide your team with increased efficiency and mobility while allowing for faster customer service. We provide mobile ordering solutions for both iOS and Android devices. Credit Card security and ease of use is a major priority for your business. Not only do we make it easy to accept EMV chip card payments at the POS, our handheld payment terminals allow your customers to pay at the table without their sensitive information ever leaving their sight. In your office? At home? Relaxing on the beach? We have you covered! Keep tabs on all that is going on with your restaurant with online Cloud Reporting & Analytics tools. Cloud based technology keeps allows you to use your own restaurant data to make precise and intelligent decisions to help your restaurant operate at optimum efficiency. Fast paced environments need a POS system that can keep up and never miss a beat. That’s why we designed our POS systems to be efficient, easy to use, and utilize robust reporting. Do you make a tasty, juicy hamburger? Why not showcase it in full HD on your Digital Signage displays. Digital Signage can increase your sales and improve the customer experience with dynamic and engaging messaging. Increase your average order by promoting value and upselling at the time of sale. We know your business is all about repeat customers. That’s why we have included FREE customer loyalty programs with all POS software packages. By simply taking your customers basic information you can enroll them in a variety of promotional programs chosen by you. You can even customize checks and receipts with customer names, and even pull up past orders for a truly personalized experience. Take it one step further by integrating a CRM program to analyze data and market to your guests thru our email & texting features. 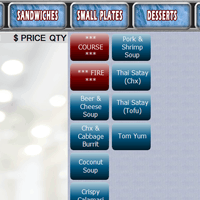 With our multi-column modifier selection method, taking orders in a counter service environment has never been easier. This unique layout displays up to 6 columns of modifiers on a single screen for fast, accurate ordering. Modifiers can be added to the sale by the way your guests tell you them, not as the POS forces you to enter them. Plus, no more need to click thru multiple windows of modifiers! You make a rocking pizza. Now you need a rocking POS that can handle the heat! Easily handle ordering and delivery in a pizza or similar concept environment with flexibility and reliability built into our systems. We understand a big part of your business involves order modifications. “Half pepperoni, one third olives, oh and one fifth anchovies!! !” With multi-column modifier selection, adding or subtracting components to pizzas has never been more flexible! Modifications can be added the way your guests say them, not as the POS forces you to enter them. Plus, no more need to click thru multiple windows of modifiers! View everything on one simple, easy to navigate modifier window improving quickness & order accuracy. Orders to the Kitchen, from Online! Express your brand and increase sales & profit with online ordering and delivery services integrations. Spend less time managing the phones and more time handling orders by allowing your customers to order online. Late night craving? No problem. With your own custom online ordering website and seamless integration from third party ordering services, customers place orders online or from a mobile device and they immediately are sent to the POS and print in the kitchen. No more translating phone orders or transferring checks from a tablet to the POS to the kitchen. We’ve got you covered! Get to know everything about your customers. Our customer loyalty programs & caller ID integrations are the perfect recipes for creating a seamless customer experience and building customer relationships. When a customer calls in craving that perfect pizza, the POS will display their name, phone number, and even their past order history making new and reorders quick and simple. Reward your customers for with your own customer loyalty program, all FREE with our POS systems. You deliver and so do we. Our delivery driver dispatch screen gives you complete control of your delivery drivers and ticket times. From the dashboard, you can see which drivers are available to take orders and see which drivers are already out making deliveries. Drivers can be assigned specific orders and can quickly pay them out when they return from their run. What good is delivery if the driver can’t get there?? With advanced delivery mapping functionality and the ability to print directions, your drivers are sure to deliver that piping hot pizza, piping hot. Create delivery zones, add delivery charges by area, and assign your customers to the order with ease. Take your operations on the road! Your business is alwaysmobile and we think a good POS system should be too. That’s why we offer a sleek, compact & portable system designed to meet the needs of this fast-paced industry. Our solution delivers all the features you need to power thru the lines and keep your food truck business rolling from the driver’s seat. Space is limited! DBS has multiple hardware and software options that pack a good punch, but with a tiny footprint. Our solutions range from compact all-in-one touchscreen & printer solutions, to traditional tablet solutions, to sleek 13.3” touchscreen POS stations with 180 degree screen rotation for customer signature. Do you operate multiple food trucks? We have solutions that allow adding and removing items from your menu management console to be pushed across multiple trucks with one touch. Taking credit cards is a must for your business, no matter where you are. We offer 4G solutions to keep you accepting payments and your lines moving. Options such as “Always On Mode” can also provide you the ability to conduct business as usual even without access to the internet. Not only do we offer solutions for store level operations, we have world class solutions for enterprise and franchise solutions. Whether you have one location or 50, DBS software solutions serve as a hub for your business allowing you to focus on your growing brand. Convenience for your guests is key. With an integration to your onsite property management system from the POS, you can charge restaurant checks directly to the room for billing. We have solutions that integrate with top PMS software solutions that may already be running your business. Create, manage and control the database of multiple restaurant sites at one time. Multi-location management is made simple with a Multi-Store Enterprise Solution. Implement menu and pricing changes for select locations or across the entire brand. You can then analyze and report on daily sales activities across a single store, a grouping of stores or all stores. Manage and adjustment employee scheduling and payroll across all locations. DBS also offers direct integration to the top payroll companies or to your current payroll deduct interface. All our POS solutions are jam packed full of features to help you run your business smoothly & efficiently. 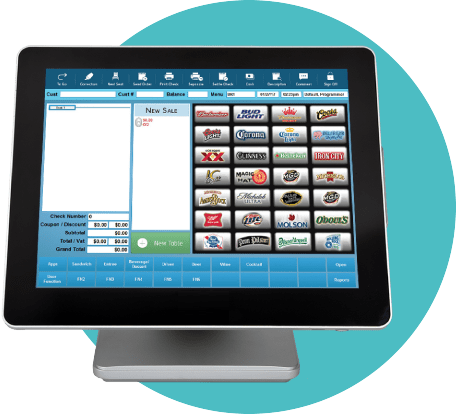 Just as there are many ingredients that make up your food menus, there are just as many that make up a great POS system designed for your industry. If you need it, chances are we can build it! We know how important a relationship between you and your customers can be. That’s why our solutions include FREE customer loyalty programs designed to keep your guests coming back. Couple this with our custom CRM programs for a truly personalized loyalty experience! In an ever changing industry, design flexibility is important. Every DBS database is programmed from scratch and is packed with features, graphics and logos, all designed around your businesses brand. If you can’t measure it, you can’t manage it. DBS has the reporting and analytics intelligence to dissect your data and help you make informed decisions about your business. Run productive operations with ideal usage statistics, guest trends, historical sales data, and much more. Always on the go?! Get the convenience of the “cloud” without sacrificing your data & speed. 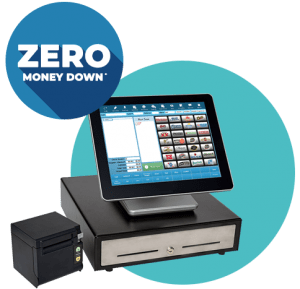 We offer a local server based point of sale system with the reliability of traditional systems and the cloud functions that every business needs. Change can be good! With multi-column modifier selection, adding or subtracting components to a menu item has never been easier! No more entries made based on how the POS forces you to do it, our solution lets you make modifications the way you want to for a quicker, seamless ordering experience. 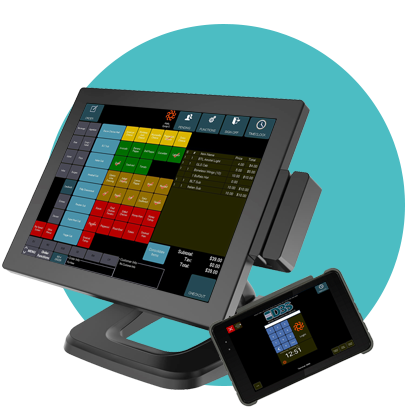 Keep your staff in front of the customers and streamline your operations with mobile tableside POS solutions. And now you can take it one step further and accept true tableside EMV transactions without the customers valuable credit card information ever leaving their hands. Some of the software solutions from DBS are regularly featured on the hit TV show Bar Rescue. Host Jon Taffer recently endorsed many of our award winning point of sale systems to help struggling bars and nightclubs improve their efficiency and profitability.